Montana je bil predlagan razred petih bojnih ladij, ki bi jih zgradili med 2. svetovno vojno za Ameriško mornarico. Ladje razreda Montana bi bile počasnejše od razreda Iowa, vendar bi bile večje, močneje oborožene in bolj zaščitene. Ladje so kasneje preklicali, še preden so položili gredelj. Namesto njih so naročili več letalonosilk razreda Essex. Glavna oborožitev bi bila dvanajst 16-inčnih (406 mm) Mark 7 topov, trije več kot na Iowi. Sekundarna oborožitev bi bila 20× 127 mm topov in 10–40× Bofors 40 mm in 56 × Oerlikon 20 mm protiletalskih topov. S širino 37 metrov bi bile prevelike za prečkanje Panamskega prekopa, za razliko od razreda Iowa, ki je lahko prečkala prekop in tako imela strateško prednost. Ladje Montana bi bile po sposobnostih precej podobne japonskim bojnim ladjam Yamato. ↑ "US Battleships". USS Missouri Memorial Association. Arhivirano iz prvotnega spletišča dne 21 August 2007. Pridobljeno dne 3 October 2007. ↑ Newhart, Max R. (May 2007) . American Battleships: A Pictorial History of BB-1 to BB-71 with prototypes Maine & Texas (Battleship Memorial izd.). Missoula, Montana: Pictorial Histories Publishing Company. str. 102–106. ISBN 1-57510-004-5. ↑ Yarnall, Paul R. "NavSource Online: Battleship Photo Archive (BB-67 USS Montana)". 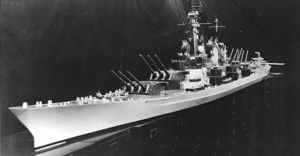 NavSource Naval History: Photographic History Of The U.S. Navy. NavSource Team. str. 148. Pridobljeno dne 30 May 2008. ↑ These would have been the heaviest warships in the US Navy at the time of their commissioning; and would have remained the class with the greatest displacement until the commissioning of the Predloga:Sclass-s, which weighed 79.300 angleških ton (80.600 t) fully loaded. "CV-59 Forrestal class". Military Analysis Network. Federation of American Scientists. 6 March 1999. Pridobljeno dne 24 December 2007. ↑ Battleships: United States Battleships, 1935-1992. p164. ↑ Johnston, Ian; McAuley, Rob (2002). The Battleships. London: Channel 4 Books (an imprint of Pan Macmillan, LTD). str. 122. ISBN 0-7522-6188-6. Keegan, John; Ellis, Chris; Natkiel, Richard (2001). World War II: A Visual Encyclopedia. PRC Publishing Ltd. ISBN 1-85585-878-9. Muir, Malcolm Jr. (October 1990). "Rearming in a Vacuum: United States Navy Intelligence and the Japanese Capital Ship Threat, 1936–1945". The Journal of Military History, Vol. 54, No. 4. Naval Historical Foundation  (2004). The Navy. New York: Barnes & Noble Inc. ISBN 0-7607-6218-X. Dulin, Robert O., William H. Garzke, and Robert F. Sumrall. Battleships: United States Battleships in World War II, fourth printing with corrections and additions. Annapolis, Md: Naval Institute Press, 1976 (1985). ISBN 0-87021-099-8. Chapter 5, pp. 153–174. Devotes more space to the components of the (chosen) design, and less to the design studies, than Friedman's work. Friedman, Norman. U.S. Battleships: An Illustrated Design History. Annapolis, Md: Naval Institute Press, 1985. ISBN 0-87021-715-1. Chapter 15, pp. 329–344. Includes details on all of the design studies conducted, including fast, heavily armored versions. Link na Google Books. Scarpaci, Wayne. US Battleships 1941–1963: An Illustrated Technical Reference, Second Edition. Gardnersville, Nevada: Art by Wayne, 2009. ISBN 1-4382-5744-9. pgs 105–106. Čas zadnje spremembe strani: 11:04, 23. april 2018.